← New BPA-Free Mason Jar Lids: Are They Really Safer? Don’t wait too long, though. If you do, the outer layers of the bulb will grow tough and stringy, and the core will grow thick and long, though it will still be edible (it is very good candied). Fennel bulbs past their prime are best used cooked rather than raw. Because much of the anise-like flavor is lost with cooking, I usually prefer to use my Florence fennel raw, but even young fennel bulbs can be a little tough for some tastes. 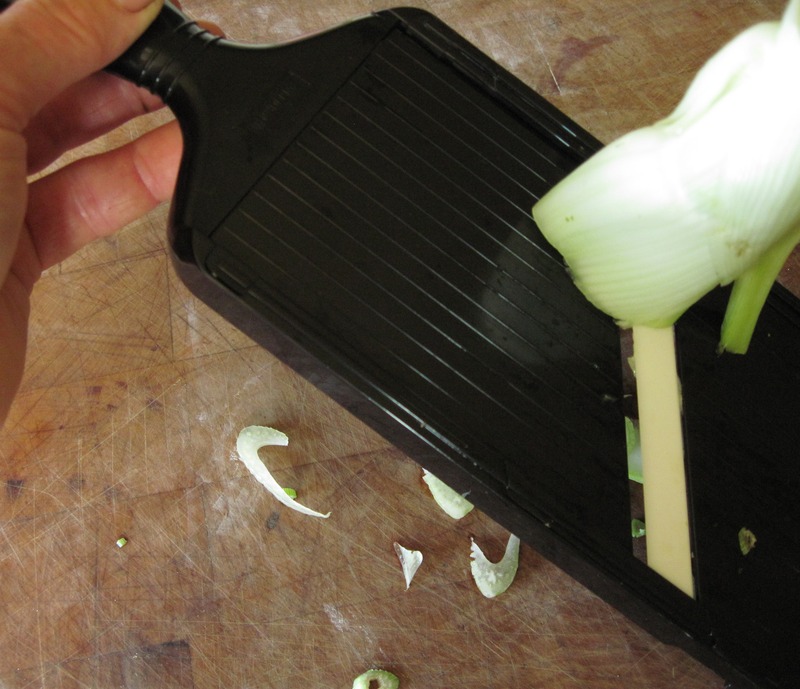 So for salads and pickles I generally slice the bulbs very fine, using a mandoline. This would be too much trouble with my big stainless-steel mandoline, which takes me at least five minutes just to set up. But my plastic little Kyocera mandoline is perfect for the job. The secret is the ever-sharp ceramic blade. I also like the simple mechanism on the back side for adjusting the thickness of the slice. 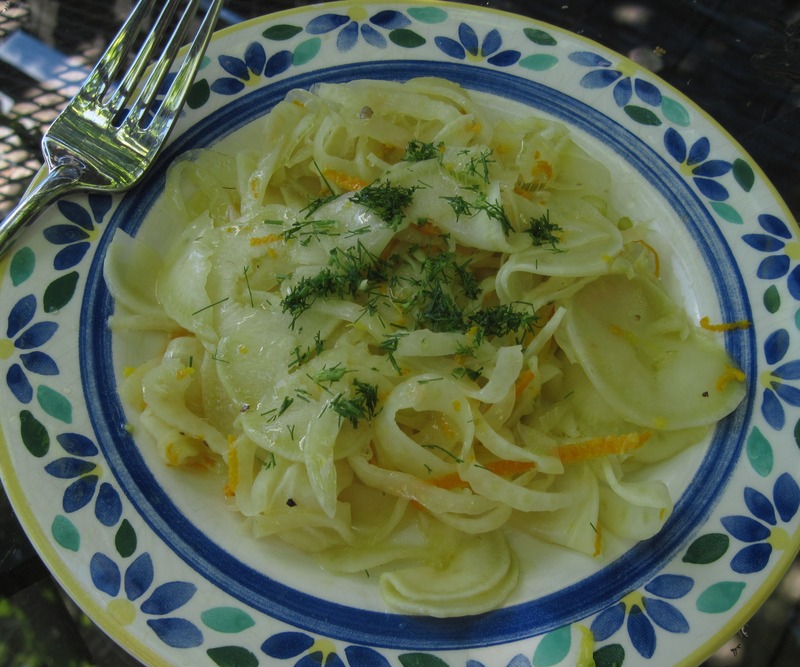 In a bowl, toss the fennel slices with the salt. Let them stand for an hour. Drain the liquid from the fennel, and toss the slices with the orange zest. Pack this mixture into a pint jar. In a saucepan, heat the vinegar, orange juice, sugar, and pepper, stirring to dissolve the sugar. Pour the hot liquid over the fennel. Cap the jar, let it cool, and store it in the refrigerator. The pickle will be ready to eat in a day or two. Serve it on top of mixed raw greens or on its own as a salad, sprinkled with a bit of minced fennel frond. 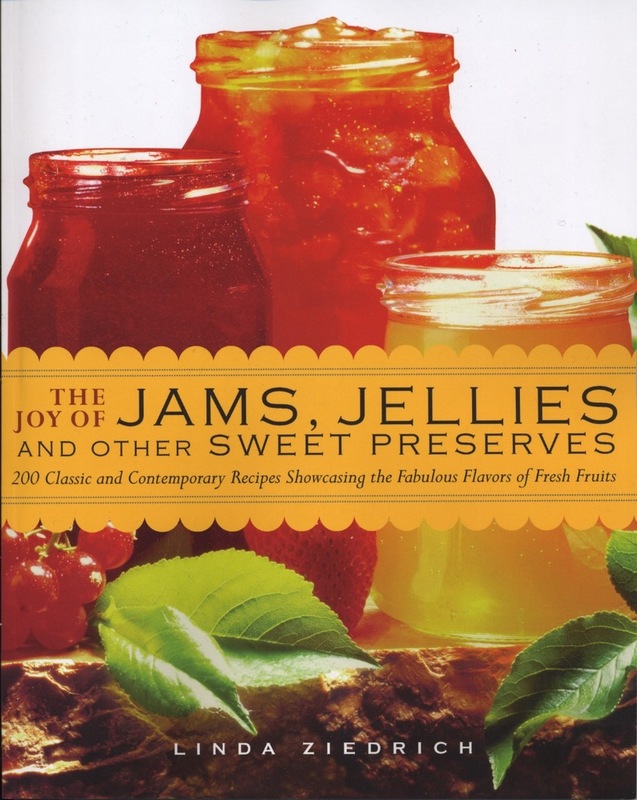 The best source I’ve found of additional ideas for using Florence fennel is Elizabeth Schneider’s Uncommon Fruits and Vegetables: A Commonsense Guide. Having grown up in Greenwich Village eating fennel from Little Italy, Elizabeth uses Florence fennel with abandon–baked, fried, braised, stir-fried, and puréed, in soups and salads and pasta sauces, and even baked whole and stuffed into chicken. *Celery is yet another cousin in the big, marvelously aromatic family Umbelliferae, so-named for their umbrella-like flower clusters. 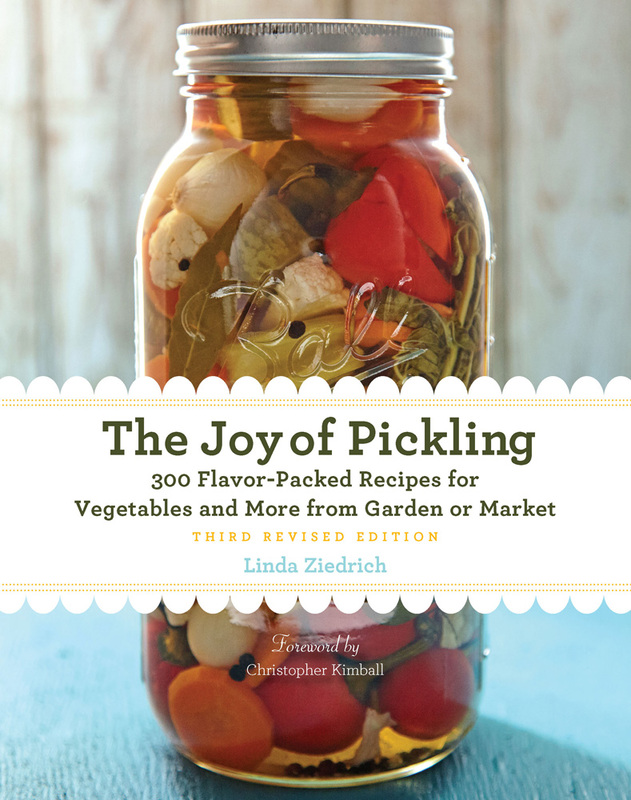 This entry was posted in Books and blogs, Pickles, Vegetables and tagged anise, finocchio, Florence fennel, Kyocera mandoline, recipe, umbellifers. Bookmark the permalink. That sounds really good. I’ve yet to try growing fennel- maybe next year. The flavor of bulbing fennel is quite mild, especially when it’s cooked. I’ve just made a big pot of puréed fennel soup, with nothing but fennel bulb, onion, potato, garlic, lamb stock, salt, sour cream, and a little butter for sautéing the vegetables. This soup is worth a try, I promise. I might have to grow a bit of bulb fennel this year just to give it another try :). 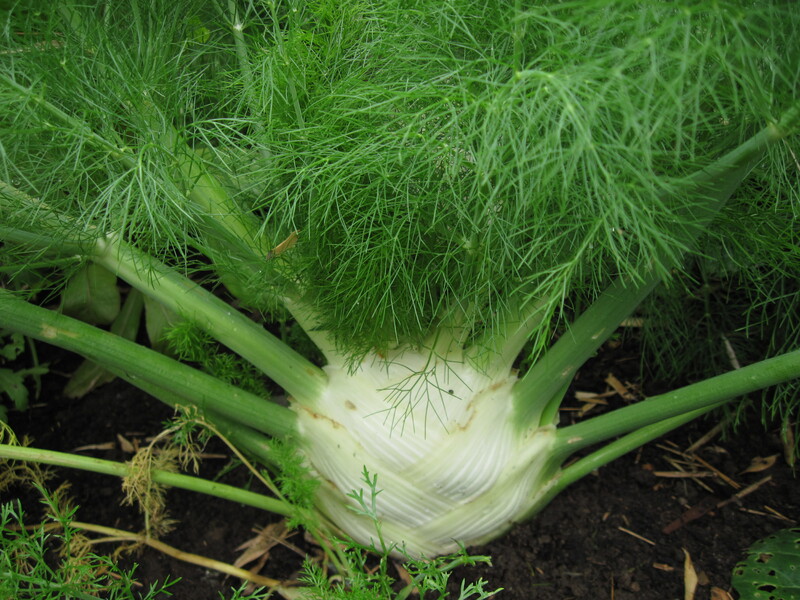 I have been trying for several years to grow bulbing fennel but the bulbs, no matter which variety, are never big, fat, rounded bulbs like I see in the produce section, just slightly plump and elongated. Any tips? I love to eat it year ’round. I have a couple plants leftover from a late fall planting that I am letting go to seed and will see what comes of it. Also, in regards to your post about coriander/cilantro, I too just let a few plants go to seed then sprinkle the seeds around the garden so they come up as they want; this has been much more successful than trying to grow in rows. This year I will try to save some seed for culinary use following your suggestions. Gretchen, it sounds like your fennel is bolting early. This could be because the weather has been hot; the plants grow best in spring or fall, not in the heat of summer. Transplanting rather than direct-seeding could cause early bolting, too. Some gardeners say they have great success transplanting Florence fennel, but they do it when the plants are tiny. A third possibility is that your seeds aren’t the best variety. I think I’ve used Perfection, from Nichols. I usually shoot for a fall/winter crop so bolting would not be a problem. I also direct seed and going back to 2008 have planted Zefa Fino, Perfection, Orion, Victorio, Monte Bianco, and Mantovano (the last 2 are from Franchi seeds). Last year I tried heeling the soil up around them but to little avail. So I am stumped but not yet defeated!